I have met many of you throughout the years, as you enjoy your meals at the Uptown. I am so happy to work in an establishment that presents a wide and wonderful variety of food, and eat here just as often as you. Recently blessed with the opportunity to travel to Germany, I couldn't wait to see how our food compared to similar dishes in their country of origin. We stayed with family in Hochspeyer, Germany, a small farming community twenty minutes from Kaiserslautern. While there, I hunted for the most perfect weiner schnitzel at five different German restaurants. With the plethora of local restaurants to choose from, each one had their own attention-grabbing qualities. At one, the basement was lined with aquariums. Another had a trail alongside the building showcasing small birds from other continents. There was one with an impressive beer garden in the front that just pulls you in. The fact that one sat on top of the mountains in the Black Forest at Tegelberg was all that it took to draw me in. And my favorite of the five featured outside seating with a view of the old architecture in Kaiserslautern. The quality of the schnitzels I sampled was reflective from each establishment to the next. I was surprised that turkey is offered alongside pork as a choice. The vast selection of toppings and sauces are where the Uptown differs. I tried one with a cream-based mushroom sauce. Another had peppercorns added to a similar base without mushrooms. Other offerings included broccoli and hollandaise, plus a Hawaiian-style topped with cheese, ham and pineapple. I did have to try the 12-hour roasted pork at one... a girl can't eat schnitzel for every meal. I never found 'the sauce' I could truly love above all. Personally, I love our traditional veal demi-glaze and lightly crisp cut of schnitzel. In my opinion, our plate surpasses 4 of the 5 restaurants I sampled. I will forever try to recreate some of these flavors, and I could definitely sample more of that beer. But no matter where I was, I always thought our spaetzle at the Uptown was better. I am accustomed to expecting perfection on the plate. I appreciate and enjoyed every effort made by the entire staff everywhere I ate in Europe, but I truly am, and love being, a spoiled American. I felt bad for the service staff in Europe after discovering that almost all have to climb up tiny spiral staircases with their trays and cook in extremely cramped kitchens! The quality and care we take in preparing each dish, plus the open space in our kitchen gives us an advantage. We can recreate these authentic dishes just as well (if not better), and enjoy them here... without the ten hour flight. I'm thankful the Uptown allows me to expand my palette with cultural dishes from everywhere. Now that I've teased your taste buds, remember that you can try our weiner schnitzel every Wednesday after 4 pm. 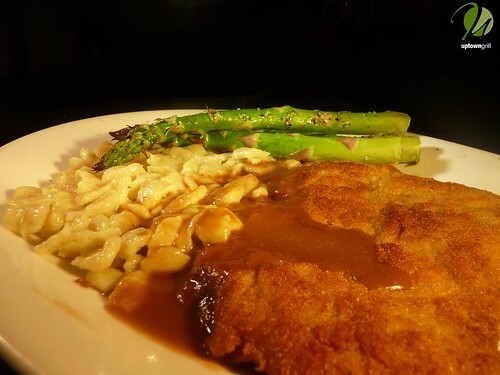 For $12.75, you can sample this delightful dish for yourself: a veal cutlet lightly floured and sautéed, served with veal demi glaze, spaetzel and asparagus.